fashionably petite: Versace Yellow Diamond Facebook Page Launch - Get Your Deluxe Sample! 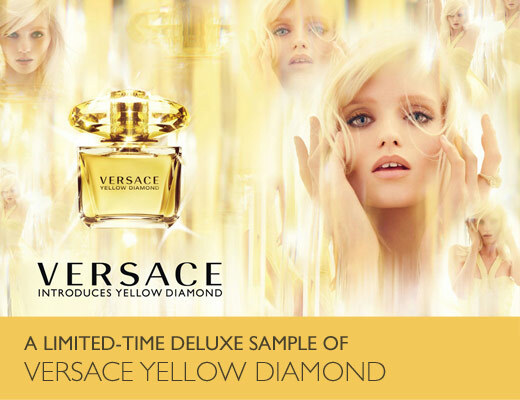 Versace Yellow Diamond Facebook Page Launch - Get Your Deluxe Sample! Versace Yellow Diamond just launched their Facebook page today and are giving away limited-time deluxe samples when you "Like" their page, fill out your information and you'll receive your sample within 90 days. You won't want to miss out on this boxed deluxe sample. Yellow Diamond has now become my favorite fragrance and the design of the bottle and packaging is just exquisite! Click here to "Like" their page and be sure to check out the official video campaign for Yellow Diamond. Versace Yellow Diamond is available Spring 2012 at Bloomingdale's, Bon-Ton, Dillard's, Lord & Taylor, Macy's, Neiman Marcus, Nordstrom, Saks Fifth Avenue, Sephora and Ulta.